I also said that I have come to realize that these factors of production are actually also the factors of wealth. I then went on to speak about wealth creation through land or alternatively called ‘Real Estate’. I mentioned Hong Kong’s Lee Shau Kee, China’s Wang Jianlin. I discussed how they have used real estate as a channel to accumulate great wealth. Today, I will talk about another way of creating wealth. 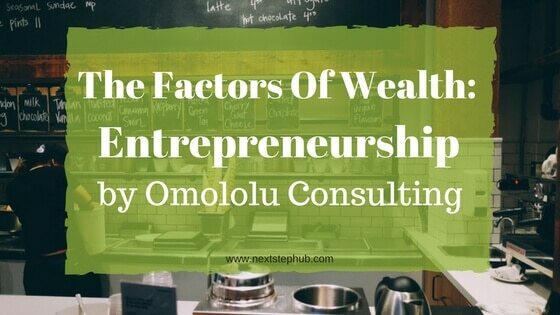 This article is about creating great wealth from entrepreneurship. I will use stories from Howard Shultz and Aliko Dangote. Shultz is the CEO of Starbucks with $3 billion net worth. Dangote is CEO of Dangote Group with $16 billion net worth. There was a quote that inspired me to quit my high paying job back in 2006 to become an entrepreneur. It says ‘Innovative people are not waiting to get to the top of Fortune 500 companies. They are creating the next fortune 500 companies. I rose rapidly within the ranks in the company I worked for. I was with the multinational firm KPMG with specialty skills in taxation and deals structuring. I enjoyed my job, enjoyed talking to the smart people around me and was very good at what I did. I looked at my career prospects to become a Partner in KPMG or a similar firm like PWC or Deloitte and I felt I could do it. However, something was missing. In the future I could see myself, I would be wealthy, but I wanted more. What I wanted was to impact people and create collective wealth using innovation. I decided to take the harder route or creating a business from scratch. I am very happy with what I have accomplished so far. I have helped grow a $3 billion industry in a developing economy and now act as an angel investor and venture capitalist. I am beginning to leave my footprints in the sands of time and there is still so much to come. Howard Shultz is an American and the Chairman and CEO of Starbucks. Schultz worked as a salesperson for Xerox Corporation after graduating. He was then promoted to a full sales representative. In 1979, he became a general manager for Swedish drip coffee maker manufacturer, Hammarplast. He became responsible for their U.S. operations with a staff of twenty. In 1981, Schultz visited a client of Hammarplast, a fledgling coffee-bean shop called Starbucks Coffee. That at the time Starbucks sold Coffee only in packs. You would buy a pack and go home to make coffee. He was impressed with the company’s knowledge of coffee and kept in contact over the next year expressing interest in working with them. A year later, he joined Starbucks as the Director of Marketing. On a buying trip to Milan, Italy, for Starbucks, Schultz noted that coffee bars existed on every street. He learned that they not only served excellent espresso, they also served as meeting places or public squares. The 200,000 cafés in the country were an important element of Italian culture and society. He tried to persuade the owners, including Jerry Baldwin, to offer traditional espresso beverages besides the whole bean coffee. After a successful pilot of the cafe concept, the owners refused to roll it out company-wide. They did not want to get into the restaurant business. Frustrated, Schultz decided to leave Starbucks in 1985. He needed $400,000 to open the first store and start the business. He did not have the money and his wife was pregnant with their first baby. Jerry Baldwin and Gordon Bowker offered to help. Schultz also received $100,000 from a doctor who saw his eagerness to “take a gamble”. By 1986, he raised all the money he needed to open the first store, “Il Giornale”. He named it after the Milanese newspaper of the same name. The store offered ice cream, coffee, had little seating, and played opera music. The ambiance portrays an Italian experience. Two years later, the original Starbucks management decided to focus on Peet’s Coffee & Tea. They sold Starbucks retail unit to Schultz and Il Giornale for US$3.8 million. Schultz renamed Il Giornale with the Starbucks name and expanded its reach across the United States. Schultz’s keen insight in real estate and his hard-line focus on growth drove him to expand the company. The rest, as they say, is history. Howard Schultz has a net worth of $3 billion. Aliko Dangote was very business minded right when he was a child, even though he was born into a wealthy family in Nigeria. Aliko established the Dangote Group at the age of 20. Back then, it was a small trading firm. But over time it grew into one of the biggest conglomerates in Nigeria. It wasn’t long before Dangote Group became one of the biggest companies in Africa. A major part of their money comes from the booming sugar trade in Nigeria. They are the main suppliers to many soft drinks and brewing companies. Aliko’s sugar refinery is the largest in Africa and is the third largest in the world. Coming from a country more known for crude oil than sugar many are surprised that Nigeria’s richest man didn’t make his wealth from oil. This is not surprising. Though popular because of its huge oil reserves, Nigeria’s oil industry only makes up 14% of its GDP. Its largest sector is Agriculture (including Agric manufacturing & food packaging). Although the Dangote Group has extensive investments in cement, flour & packaged foods if you call Aliko the Candy King, you will not be wrong. Aliko Dangote lives in Nigeria and has a net worth of $16 billion. Tell me your opinion: Are you an entrepreneur? What’s your business about? Would you like to share your experience? You can post a comment here or shoot me an email debo@omololuconsulting.com. I read every single response (yes, really).